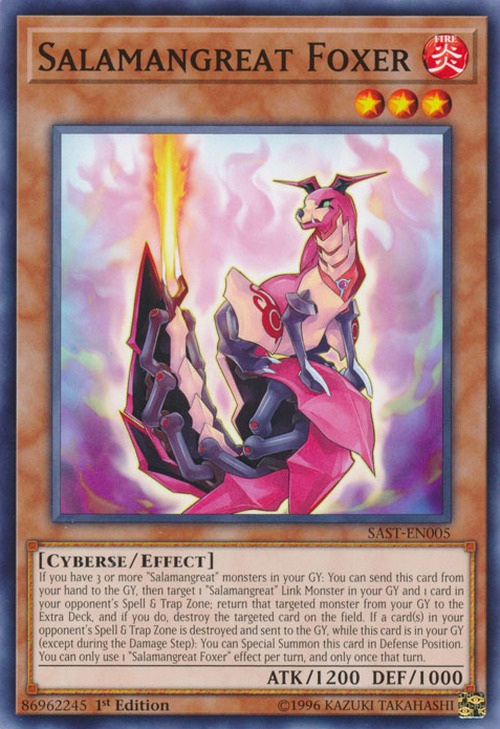 If you have 3 or more "Salamangreat" monsters in your GY: You can send this card from your hand to the GY, then target 1 "Salamangreat" Link Monster in your GY and 1 card in your opponent’s Spell & Trap Zone; return that targeted monster from your GY to the Extra Deck, and if you do, destroy the targeted card on the field. If a card(s) in your opponent’s Spell & Trap Zone is destroyed and sent to the GY, while this card is in your GY (except during the Damage Step): You can Special Summon this card in Defense Position. You can only use 1 "Salamangreat Foxer" effect per turn, and only once that turn. This card is the female counterpart of Salamangreat Foxy. 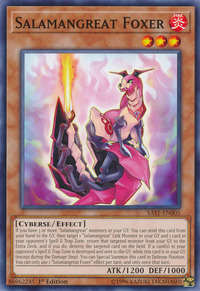 This card's artwork is a mirrored version of Foxy, but is pink instead of blue and its ears are pointed horizontally while Foxy's ears are pointed vertically. This card's effect destroys face-up Spell/Traps similar to Foxy, but does so from the hand instead of the Graveyard. It also Special Summons itself from the Graveyard when an opponent's Spell/Trap is destroyed, which would trigger upon the activation of Foxy's destruction effect. Both are Level 3, but their ATK/DEF are the opposite of each other's: Foxer has 1200 ATK and 1000 DEF, while Foxy has 1000 ATK and 1200 DEF. This monster appears in the card artwork of Salamangreat Recurrence.